Discussion in 'Gear & Equipment Discussion' started by Halli_iceland, Apr 16, 2008. Cageside is going to be big! i wonder how many users have cageside in their signature..i've seen quite a few now. his name out there and got there first for my gear. I can't wait for the blue/white shorts to come out, I am going to jump on them. me 2 they look great! have you seen the Jack Daniel's t-shirt design from cageside? The blue shorts look sweet. The new shirt sounds interesting, can't wait to see it. Count me in on the Boomer fan club. Boomer rocks, and Cageside MMA is my first choice for any gear and equipment. Thanks guys! I appreciate it! Been sick as heck the past 20 hours. Finally getting up the strength to get on the computer. Anyone who knows me knows that I have to be pretty darn sick to stay off the computer for more than 2 hours. Anyway, feeling better and Cageside will be ready to roll in the morning. I hope to have the blue shorts in 3-4 weeks, maybe sooner. I picked up a recent copy of Fightsport and was happy to see your logo on the clinch gear ad. Hey all, I just ordered the Fairtex super bag gloves and cagside wraps from them, waiting for them to arrive. Total came out to be cheaper with the April coupon code then if I bought only the gloves from any other online store. I will post a review of the service and products when they arrive. Yes, Aaron and Clinch Gear are awesome! I don't think I'm alone when I say I don't care for mock ads. I'd rather wear something original. I like the Jack shirt, I'd prefer Boomers MMA though. Ha! 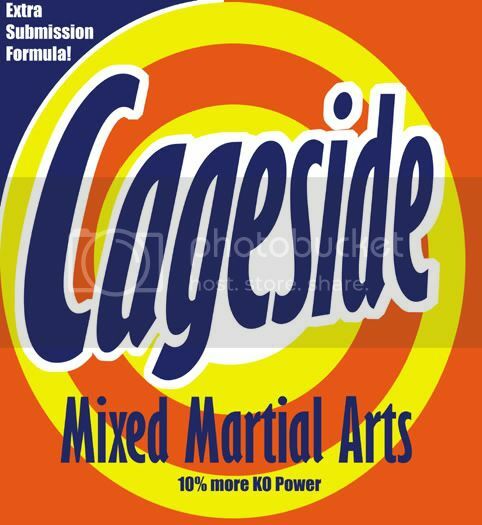 I like Boomers too, but Cageside is a better name for the long run. Boomer is just a red neck from North Carolina - Cageside sounds like a real company. Thanks Evil Glove. Just trying to come out with some different MMA shirts - I know they are not really new, but compared to everyone else with the skulls and such - it is a bit different. I really like the orange. yeah, i'm really liking the orange. I like the T-shirts ideas too.